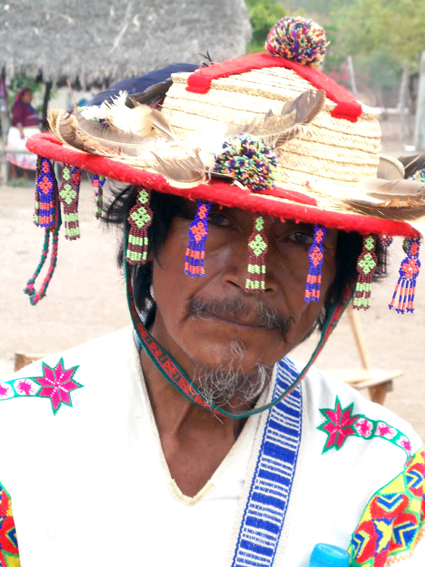 The ancestors tell us that a long, long time ago, in the Huichol Forest, the elderly met to discuss their situation: their people were sick, dying. There was shortage of food, water. The rains were delayed and the earth was dry. They’ve decided to sent hunting, four young man, to bring food for the community and to share whatever they brought back with them, be it large or small. Each one of the young man represented an Element, The Fire, The water, The Air and The Ground. The very next morning, the four young man learned of their journey and each man has brought with him a bow and arrow set. They’ve walked for days until one afternoon a deer jump from out of the bush. The deer was big and fat and the young man were tired and hungry but when they saw the deer they fought their hung and thirst and they started running after him, never letting him out of their sigh. The deer looked at the young man and saw a sorry bunch so he allowed them to rest the night and continued the chase the next morning. This went on for a week or so until they’ve reached Wirikuta ( a place located in the San Luis Potosi Desert and considered a sacred place for the Huichol People). There, they’ve arrived to the door at the side of The Forrest of Los Narices, where The Spirit of the Earth resides. The deer jumped to the other side (over the end), one of the young man shot his bow but the arrow fell short and landed on a figure on the dirt that looked just like the shadow of a deer. The Shaped formed just nearby of the shadows from some Peyote plants. The plants were shining like Emeralds in the sun, all of them facing the same direction. Confused, the young man decide to collect the strange plants which were forming the shadow of the deer that has just jumped and bring them back with them to the village. After days of walking, they’ve arrived to the homestead Huichol forest, where their people were waiting for them. They’ve shared the Peyote Plants between all of the villagers and the strange plants cured their thirst and their hunger. Since then the Huichol worship the Peyote, the same way they worship the Corn and the deer, its guiding spirit. And so each year, until this day, the Huichol keep walking and wandering, keeping the path alive in the Sierra Wirikuta (the Wirikuta homestead forest), asking ask God for rain, livelihood and health for its people.